Disney's Grand Floridian Resort and Spa is known for its old school opulence, with Victorian decor inspired by seaside hotels of the late 19th century. Everywhere you turn in the hotel lobby, you are surrounded by marble floors, domed windows covered in stained glass, and elevators designed to look like oversized bird cages. 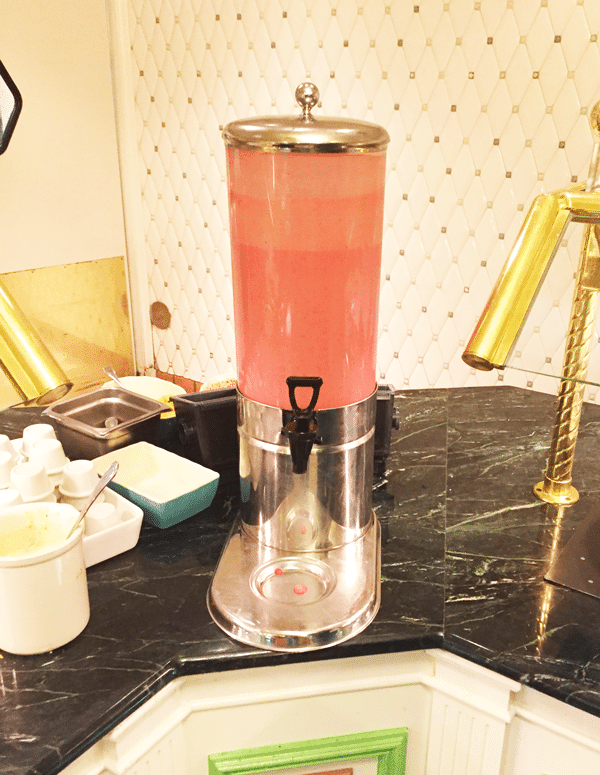 Just off the way from the concierge desk holds one of the resort's most whimsical dining experiences in a restaurant designed to capture the essence of an 18th century amusement park: 1900 Park Fare. Open daily for breakfast and dinner, 1900 Park Fare features a wide buffet of delicious items, with a few fun characters thrown into the mix! Breakfast time features characters from British favorites Winnie the Pooh, Mary Poppins and Alice in Wonderland. 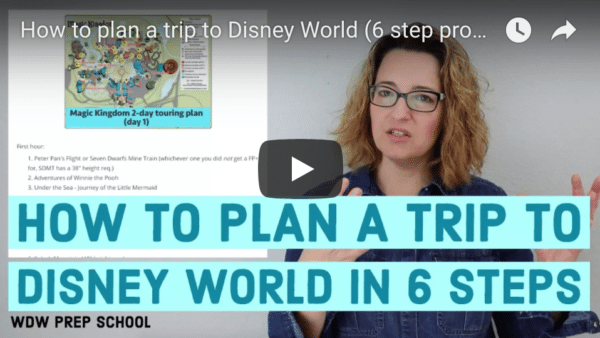 However, this past month (thanks to WDW Prep School!) I got to experience dinner at this establishment for the first time ever(!) 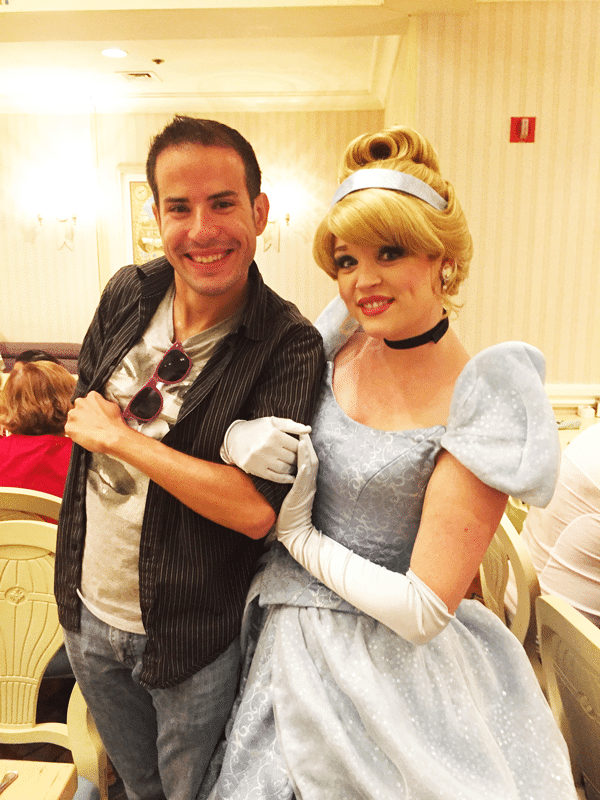 with Cinderella and members of her royal and not-so-royal family. A photographer is in the restaurant's foyer to take your picture in front of the beautiful mural (photo is included with Memory Maker if you purchase it) before the seater shows you to your table. 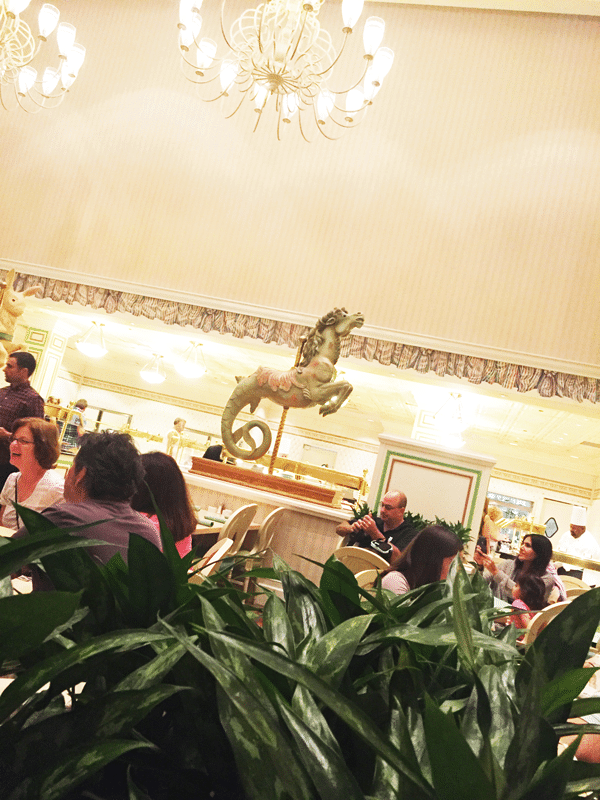 The dining room at 1900 Park Fare is filled with so many beautiful details that hark back to the late 19th/early 20th century including this gorgeous carousel seahorse! We were greeted by our server within seconds of being seated and he took our drink order, then explained to us that each character would make one and only one stop at our table during our visit. 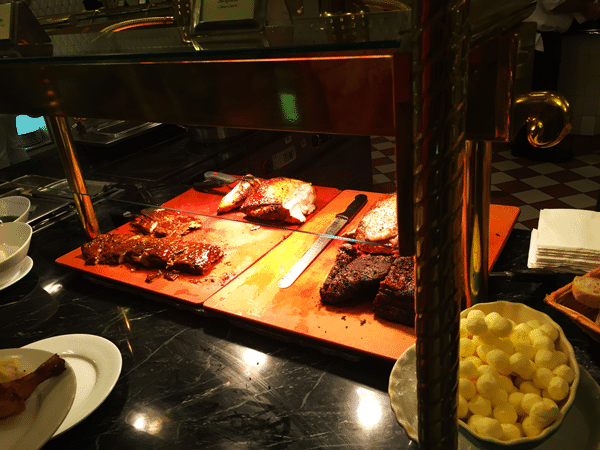 Not wanting to miss any of the action we headed straight for the buffet! 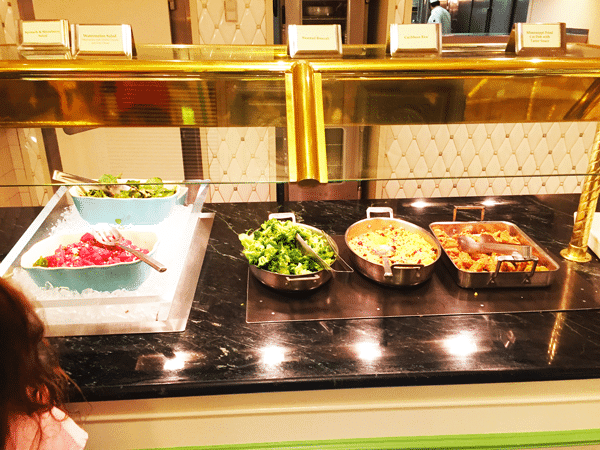 Just about everything you can imagine to eat is featured on this buffet at dinner time. 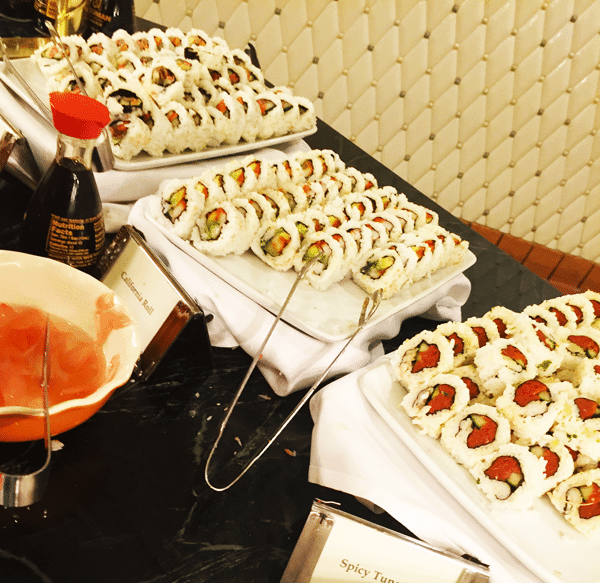 Sushi rolls, carved to order sirloin and turkey, hot rolls, vegetables, Asian-inspired beef and rice dishes, and seafood are just a few of the items you can munch on during your visit. 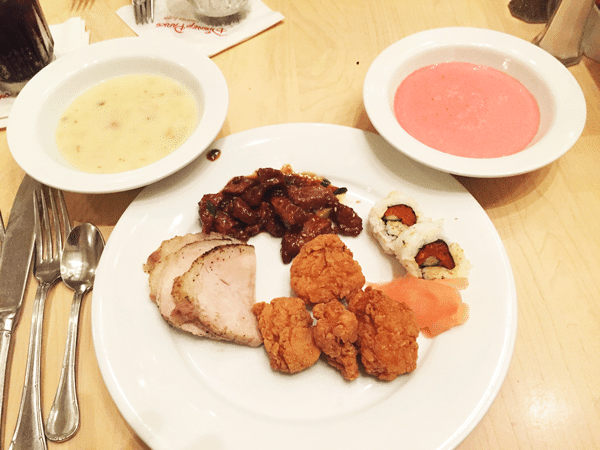 My personal favorites on the buffet line included the Key Lime grilled chicken, mashed potatoes, macaroni and cheese (yes, off the kids' buffet, don't judge me) and the Ahi tuna noodle salad. My absolute favorite thing had to be the restaurant's signature strawberry soup. Yes, I said that right. Strawberry soup. By the time we were finished with our first plates, the royal procession was announced in the dining room, and Cinderella and Prince Charming danced their way to the middle of the room. They then proceeded to greet tables in the restaurant individually, posing for pictures. The Fairy Godmother was a delight as well, as we were not expecting to see her that evening. Met my long lost brother tonight. You owe me half of that kingdom you run, bro. Prince Charming lived up to his name and more. He acted very surprised that I wanted to take a photo with him, as he said not a lot of other gentlemen want their picture with him. Very gracious. Had a lovely dinner with my gal pal Lady T last night. She told us stupid pirate jokes and we had a very long conversation about how elated she was to get away from her daughters for the night. If you ever have the chance to have dinner at 1900 Park Fare, do it. It was Lady Tremaine that stole the night for us, though. She walked up to our table and immediately asked my friend to repeat the pirate joke her mother told her while they were playing bridge. She was hilarious! 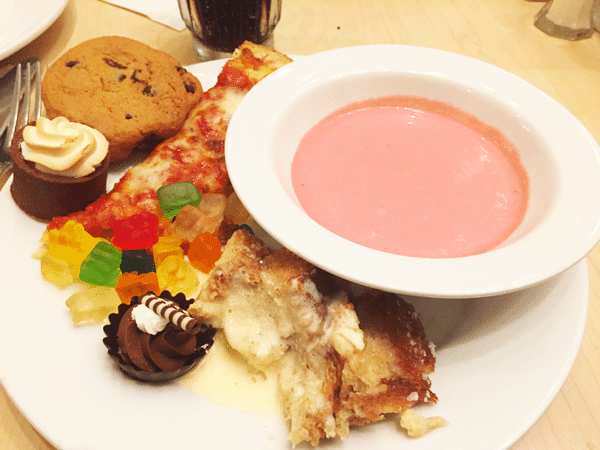 After several plates of food, we debated on whether or not we were up for dessert. There were lots of choices on hand, from brownies and cookies and Gummi Bears to key lime tarts and cupcakes. What did I end up choosing? Another bowl of strawberry soup, of course. 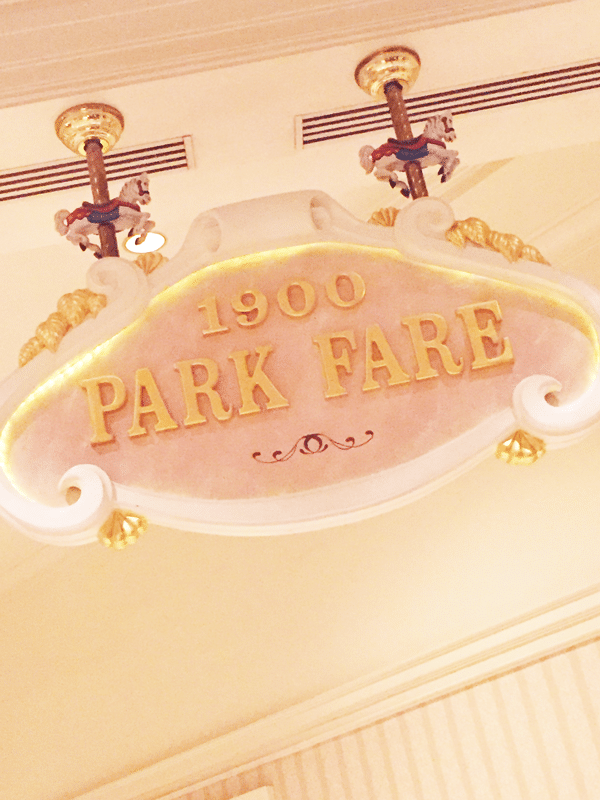 1900 Park Fare dinner is overall a wonderful dining experience and I had a lot of fun (and a lot of food!) This restaurant is one of the more difficult to book an ADR for so be sure to make your reservations as soon as possible before your trip. Hey, this is Shannon again! Loved this review from Dustin. Just wanted to give you a couple of thoughts about 1900 Park Fare (actually, most of this applies to all character meals). 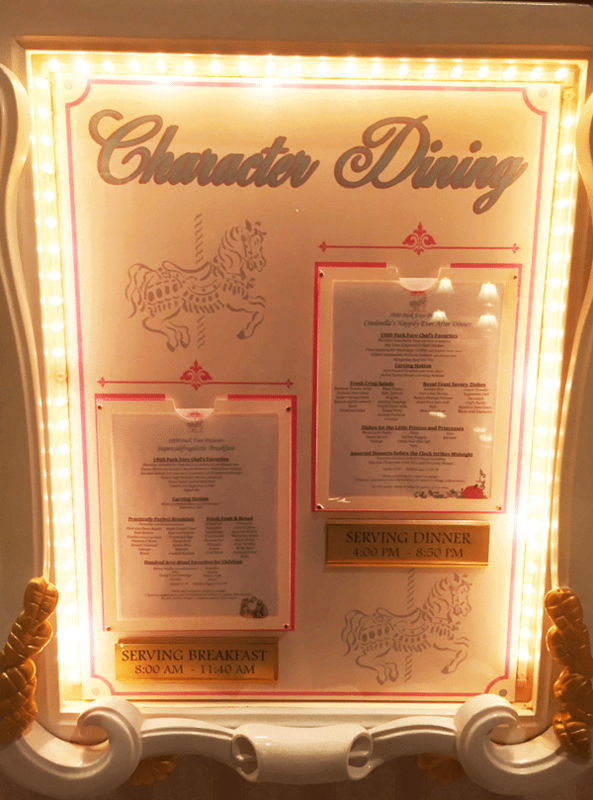 As Dustin mentioned, the characters can vary so go in with an open mind (the mix of characters here is part of the fun - very unique and kind of random compared to other character dining locations). If the characters don't make it to your table, be assertive and ask the attendants to make sure you see them. Think about the background of the pics before you take them. You might not want the buffet or lots of other people in the back. See if you can position yourself in a spot that looks a bit nicer in pics. Thanks for this review! We are going to be eating here in November with my two year old daughter who loves Cinderella! The Cinderella dinner is on our reservation list for our fall trip. Grand Floridian is such a gorgeous resort. Thanks for the tips. We are planning to book this meal on our arrival day. I was planning to give us 3.5 hours from time our plane lands to get to the restaurant. We will be using Magical Express to our hotel and then take cab. is that enough time? Also, how long should I estimate for the meal itself? I don’t want to rush it, but am planning to book some fast passes for afterwards at MK. So excited for our trip! Thanks. What hotel and which restaurant? We are staying at port Orleans french quarter and eating at 1900 park fare for dinner. Thanks! With a taxi or Uber to the restaurant, you should be able to do that. Excited to book this restaurant as my first port of call on my arrival day. I’m staying off site so will park at the resort and if I’m not too tried after dinner and traveling all day I’ll head over to MK. Or that’s the plan anyways! Excited to meet my first characters too!! 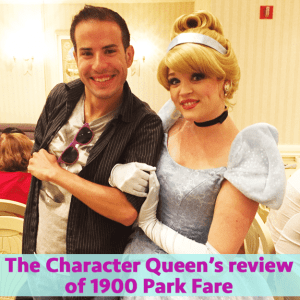 1900 Park Fare was one of our favorite character meals- so much delicious food and the character interactions were the best! The Tremaines were hilarious! They liked the autograph sketch book we had made so much that Lady T tried to steal it, announced to the whole restaurant that we were the only people she’s ever met with any taste (we had drawn them on their own separate page), and they came back to our table 2-3 times! It was a blast. I asked Cinderella if she gets along with her step family now since they were at ‘her’ dinner and she said “oh yes, they are much better now because I taught them some manners!” LOL When I mentioned this to Anastasia, she knelt down next to my daughter (5) to demonstrate her ‘manners’- she got a lot wrong and my kiddo corrected her- and then even showed us that she is learning to speak French. I asked her ‘but aren’t you from France?” and she said “oh yeah, then it’s time I learned to speak the language!” It was a blast! My husband graciously gave up his only non Disney character meal (sci-fi diner), so that his wife (me!) and 5 year old daughter could go to 1900 park fare! He was game for reserving is every princess character meal, as well as character meals at Tusker House and Crystal Palace. She and I are even doing the Perfectly Princess Tea Party (he is exploring Epcot on his own that morning much to his excitement). Add in the fact that we are staying in the POR Royal rooms and will be hitting a few Frozen options, we will be princess character queens by the end of our trip. Disney is not my DH’s jam, so we feel pretty blessed that he is doing all this for us. He even did all the fast pass and dining selection at midnight so that we could get everything.